Hello. I use Libcanard with STM32F4. And I compiled my own custom message. GUI looks it fine. In canard core I see that crc calculated using ‘signature’-field (if size > 7 bytes). It seems, that calculated signature (through dsdl) is wrong. How can I calculate it correct (manually)?? So GUI tool still send errors. The most likely reason is that the message definition used by the GUI tool differs from the one used by your libcanard-based system. Please ensure that the definitions are exactly identical. Also, you can’t define vendor-specific messages inside the UAVCAN namespace. You should use a separate root namespace for your custom data types (although this is not directly related to your question). Thanks. But this works fine in another board with Nuttx and libuavcan. That says that signature-field is correct. And we able to include own message to uavcan-namespace… Hm… As for libcanard, troubles are still not solved. As for libcanard, troubles are still not solved. Let’s have a look at your code. 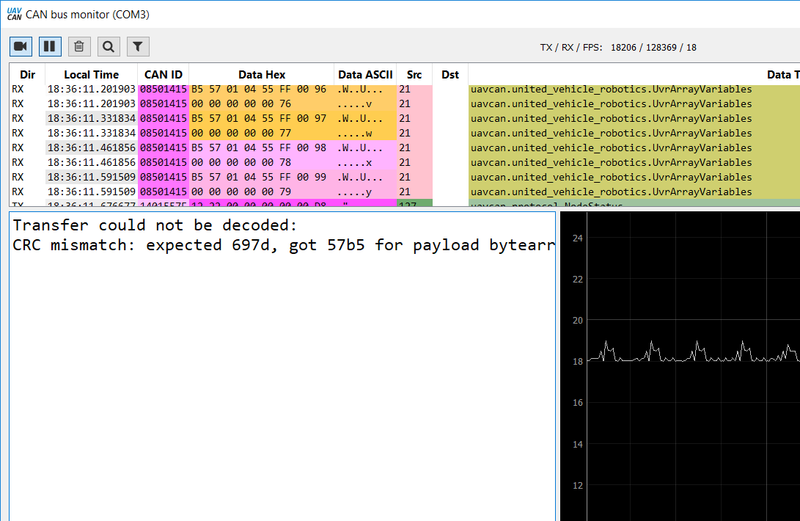 I have doubts for last argument of canardBroadcast (length of packet), but I see - 8+5(void)+3+64=80 (10 bytes). But CRC is calculated with fail. Good day!! O, great thanks.! I launched script and got a valid ‘signature’-field for my message. And now it works clearly fine. I little confused …how can I define my own namespace? I see extension of file like *.uavcan. Is it means that i need use another extension (as own namespace) for custom messages? I see extension of file like *.uavcan. Is it means that i need use another extension (as own namespace) for custom messages?